This is the second installment on the topic of cul-de-sacs, the quintessential elements of sprawl. The first installment proposed a Micro Sprawl Repair using the Complete-the-Neighborhood Module. The Complete-the-Neighborhood Module could be applied to any two or three lots on a cul-de-sac in any subdivision where blighted or foreclosed properties exist, or where the community has decided to upgrade their quality of life by introducing new amenities. This post discusses the use of the Supportive Living Module to create opportunities for senior living within a single-family subdivision. Aging in place – growing old and retiring in the community where a person lives – is an important issue for baby-boomers who want to lead longer and happier lives. Nursing homes are currently separated from neighborhoods because they are treated as commercial or medical land uses. They suffer from gigantism, similar to other non-residential uses in sprawl such as malls, big-box retailers, and educational, medical or even penitentiary facilities, and they tend to be concentrated in mega-structures. The isolation and large concentrations of patients in these places often lead to depression and alienation, while the long distances preclude regular visits by friends and family. Cul-de-sacs have become easy targets for criticism and even ridicule by an up-and-coming generation of newly minted urbanites and activists. After all, cul-de-sacs are symbols of a past trend – sprawling far-fetched suburbs, isolated and boring. But do cul-de-sacs truly serve the older generations who were originally drawn to them? Once considered the safest place for children to play and for families to have peace and quiet, cul-de-sacs are becoming problems for the aging population. Far away from everything, they have become islands of isolation and loneliness when an older person can no longer drive. The choices are to move to an all-inclusive senior facility far from town or to a place in the city that is closer to daily needs. But will all seniors be able to afford these choices? Most likely not, as the demand for houses in the exurbs is decreasing. If they are not able to sell their large homes, millions of older suburban residents will be sequestered on their cul-de-sacs. We must do something about these car-dependent residential subdivisions with cul-de-sacs, built on the metropolitan peripheries, so many of which have been affected by foreclosures and blight. The separation and isolation that once was considered a virtue has now become a problem. Communities must take control of their own destinies. They must challenge their fossilized governing regulations and rebalance their single uses, bringing more flexibility, adaptability, and enterprise to subdivisions and cul-de-sacs. The Supportive Living Module is in the form of a traditional two- or three-story building where seniors can receive skilled, community-based assistance. The structure can be accommodated on two lots. Because the building is small in size, with six, seven units per floor, it is easy to manage, and its scale is appropriate for the residential subdivision. Its volume can easily blend with the surrounding single-family houses. 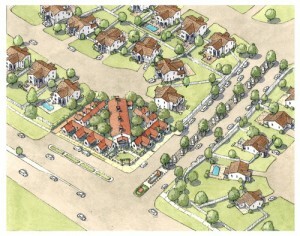 If the building is located at an entrance to a subdivision or next to an existing amenity, it is possible to assign its ground floor to mixed uses: a corner store, a daycare, a hairdresser, a post office, or a small diner with a kitchen that could also provide food to the senior residents. (These uses, by the way, are also accommodated in the first module). The upper one or two floors consist of bedrooms for the residents, with common living quarters as well as a caretaker’s suite. The second option includes attached single-story cottages for Semi-Independent Living The L-shaped structures form private courtyards, with the interior consisting of a bedroom, a spacious living room, and a kitchenette to be used by the residents or their visitors. A common facility building in the middle contains offices, rooms for medical exams and procedures, and potential living quarters for one or several caretakers, as well as a kitchen to supply meals to the residents. This central building may be connected to the cottages by a corridor to be used on rainy days. There is also common courtyard space between the cottages and the facility building. This semi-independent module will be well integrated within the community and will provide the opportunity for intensive care and assisted living close to family and friends. The strategy is to transition from the mega scale of nursing homes in sprawl to a smaller neighborhood-based scale in which financing, construction, maintenance, and operation can happen in smaller increments, providing jobs close to home and allowing residents to age in place. Credit: The drawings were developed together with Chris Ritter and Eusebio Azcue and are based on ideas and designs from DPZ’s Lifelong Communities charrette conducted for the Atlanta Regional Commission, in collaboration with Lew Oliver. For more on the topic of urbanism and senior living please read the new book, Livable Communities for Aging Populations: Urban Design for Longevity, by my DPZ colleague, Scott Ball.